Harira is a traditional Morrocan soup, typically served during Ramadan to break the fast each evening, at sunset, or on special occasions like weddings, etc. Moroccans actually eat it throughout the year, and of course, you can too. :) It's also served in other North African countries like Algeria & Tunisia, etc., as well as in Pakistan & India. Of course, each region has its own way of preparing & serving harira. For example, in Algeria, harira is served with slices of lemon. The soup is often eaten with a special wooden spoon called a mgurfa (in Moroccan Arabic) or taghanjat (in Morrocan Tamazight). There are a zillion different variations of this soup, which can contain any number of ingredients. Most start with a base of vegetable or meat-based broth, chickpeas, lentils, tomatoes, onions, & various "warm" spices like ginger, saffron, cinnamon, & pepper. Some versions may also contain beaten eggs, cubes of meat (usually lamb or sometimes chicken - beef is far less common), potatoes, rice or broken vermicelli noodles, semolina flour (which is mixed with water to form a semolina paste that's similar to a roux), spinach, carrots, celery, scallions/spring onions, etc. I've even seen some versions with tahini &/or sesame seed oil. Some may also contain smen, a preserved, salted butter that's similar in concept to Indian ghee (i.e., clarified butter), except that it has a distinctive Parmesan-like taste to it. If eggs are added, a squeeze of lemon juice is usually added to the beaten egg before it's added to the soup. My version stays fairly true to the standard template except for a few minor alterations: I left out the flour & vermicelli noodles, & have also added olives. Although I didn't consult any sources when I decided to add the olives to the recipe (it just sounded good! ), I later discovered that harira made with olives is apparently customary in Algerian city of Sétif, so apparently my sixth cooking sense must be working. :) I already knew that olives, particularly green ones, are often added to chicken tagines, so it's really not that much of a stretch. In Morocco, before one digs into a big piping bowl of harira, it's customary to first eat snacks like dried figs, apricots, or dates (which are often stuffed with almonds or almond paste), hard-boiled eggs sprinkled with salt & cumin, fresh seasonal fruit, honey-drenched pastries, & other baked goods, which are typically served with milk, coffee, or mint tea. Directions: Soak lentils overnight in a heat-proof bowl of boiling water that just covers the lentils. In a mortar & pestle, pulverize garlic, ginger, & salt into a smooth paste, & set aside. Pour all dry spices into a small bowl, mix well, & set aside. Heat olive oil in a large pot over low heat. Add onion, garlic-ginger paste, & bay leaf, and sauté until tender (& onions have become translucent), about 5 minutes. (Lower heat even further if browning starts to occur.) Deglaze with vegetable/chicken broth, stirring a bit to release any ingredients that've stuck to the bottom of the pot. Next, add water & all dry spices, turn up heat, and bring to a rolling boil. add lentils & cook for 2-3 minutes, then reduce heat to medium-low, cover with a lid, & simmer for about 45 minutes, or until lentils are soft. If the soup's level has dropped too low, add more water until the lentils are completely covered. Next add garbanzo beans, green & black olives, & cook for another 10 minutes. (Add more water if necessary. Soup should be thick but not to the point where the solid ingredients have exceeded the liquid content; the solid to liquid ratio should be about even.) Then, add spinach, grape tomatoes, & tomato paste & cook for 5 more minutes. Remove from heat. Add couscous, cover with a lid, & let rest for 5 minutes. Discard bay leaf. Stir in lemon juice, & ladle soup into bowls. Sprinkle with cilantro &/or dried fruit (if using). Top each bowl with a few drops of harrissa (if using) & a dollop of Greek yoghurt & serve. 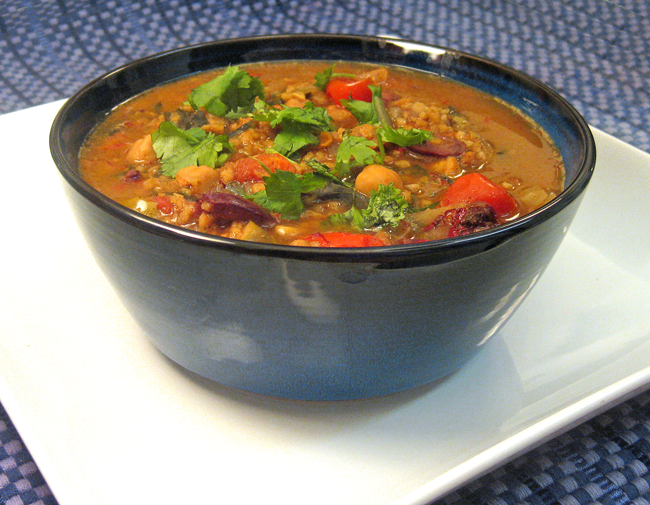 You can also serve this soup with Moroccan flat bread (khobz), if desired. Chef's Notes: It's a good idea to do as much of the kitchen prep as possible in advance (i.e., soaking the lentils overnight, making garlic-ginger paste, measuring & blending the dry spices, etc. ), it'll make the whole endeavor go even faster. It's also possible to make this soup ahead of time, although I probably wouldn't make it more than a day in advance, in order to keep it as fresh as possible. In fact, this soup tastes even better the following day, as it will thicken a lot while it's resting in the fridge. If you'll be making it a day in advance, you'll probably need to reconstitute the soup (i.e., add several cups of water to it) before reheating it. This recipe can also be made in a slow-cooker/crock pot. Also, if you prefer, you can substitute orzo or other miniature pasta for the couscous if you so desire. If you decide to take the traditional route & make this dish using vermicelli noodles, be sure to break them into small pieces before adding them to the soup. *There are many different kinds of saffron -- Spanish, Turkish, Persian, Kashmiri, French, Italian, Portuguese, Californian, Algerian, etc. -- and both the potency and the price can vary greatly depending on its origins. High-quality Spanish saffron will be more expensive than say, Algerian saffron, but it'll also be the more concentrated in terms of flavor. (Typically, the darker the saffron, the stronger the flavor and aroma.) Of course, you get what you pay for, and this is especially true when it comes to saffron. :) Whereas only a pinch of Spanish saffron might suffice for a particular recipe, you might need several scoops of Algerian saffron just to get the same effect. (Algerian saffron is one of the least expensive kinds of saffron.) So, it's usually a good idea to season to taste when it comes to saffron.